Edited: Unfortunately, Conrad is no longer dog-friendly wef 1 August 2017. We're heartbroken that we have one less staycation option, but at least we had a great time there. Thanks again to all the Conrad staff that made our stay so memorable. 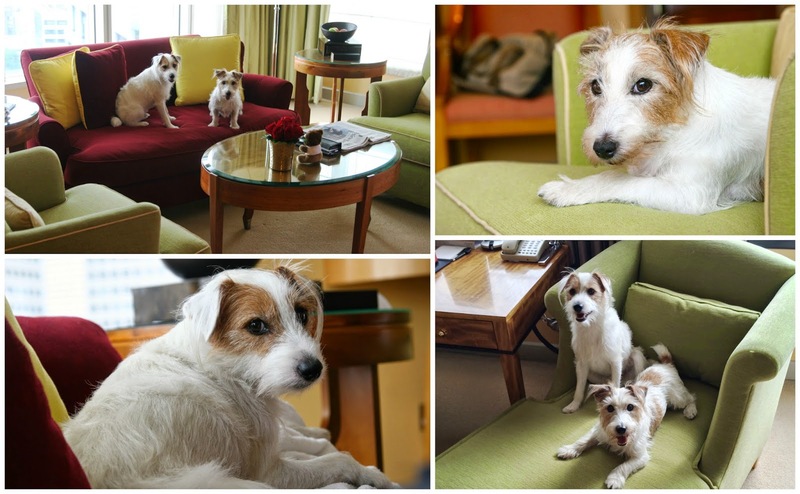 After having a blast at last year's Capella Staycation, Mummy decided to make a dog-friendly staycation a yearly affair at the Loo Lim Household! 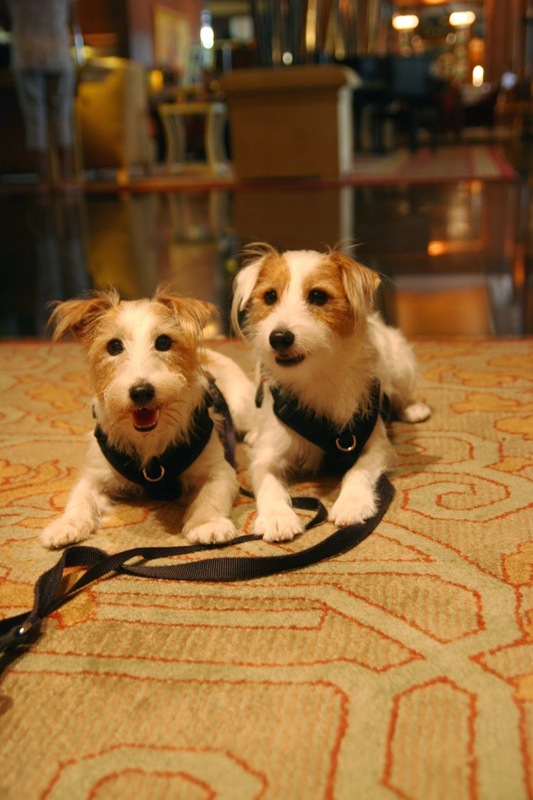 Instead, we decided to head to a hotel that allows two dogs. Unfortunately, we really don't have many options. Both permit up to two dogs (weighing no more than a combined weight of 34kg) in a room. There's a catch though. A one-time pet cleaning fee is applicable. Although Conrad's charge of $120 is significantly higher than that of Hilton ($50), Mummy decided to go for that as she had stayed before and really liked the location. To ensure that there was ample space for the four of us, our parents decided to pamper themselves by booking a small suite. The truth was, we don't really care. The moment Mummy started packing for the stay, I went nuts and super excited! Pecan ah ma, on the other hand, was just confused. Our check-in time was after 2pm. Even though we arrived around 2.30pm, we were rather disappointed to learn that our room wasn't ready as the wedding couple who was occupying it before us only just checked out. Mummy wasn't too pleased that we had to hang around in the lobby for about an hour and was a little surprised that there wasn't any other suites for us to check into immediately. As for us, we were pretty cool just chilling at the nice carpet in the lobby. Well, that was until Pecan ah ma decide to bark at a luggage. And with that, our parents decided to bring us for a walk around the area. 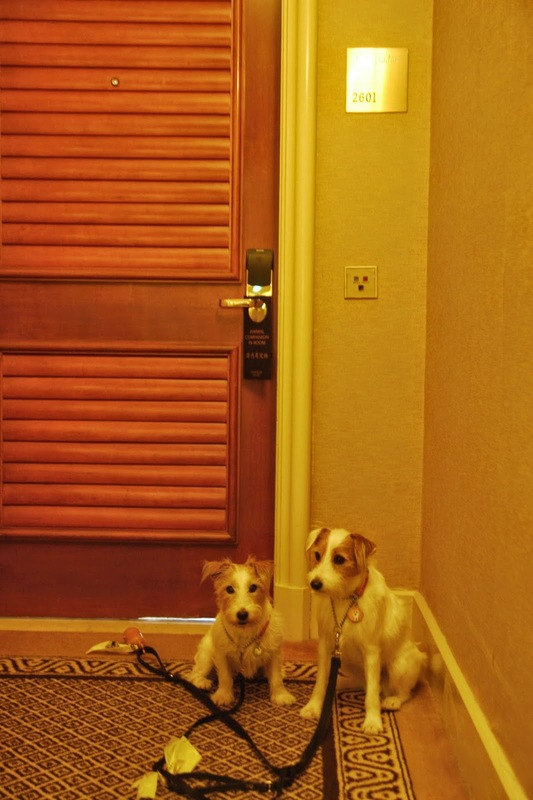 It was when we finally returned and were brought to our room that Mummy realised why they made us wait for the room, rather than give us another suite. We actually got upgraded from a 1-bdrm Executive Suite to a 1-bdrm Presidential Suite. Holy cow~ The presidential suite supposedly cost almost 3grand a night!!!! So, we got a pretty good deal! And the view was..... awesome. No wonder we were blown away by it. We loved the view so much that we actually spent a fair amount of time just staring out of it, checking out the moving cars (they looked like ants!). Conrad's pet-friendly perks came in the form of a door sign, a chew toy and a good solid bowl for us. We really appreciated having the sign on the door. However, we felt that it barely made any difference as the service providers we encountered over the course of our stay continued to ring the bell as per normal. So of course, that triggered our barking a fair bit. Thankfully the walls were thick enough to buffer that. I took to the rope toy immediately and got into a good game of tug. 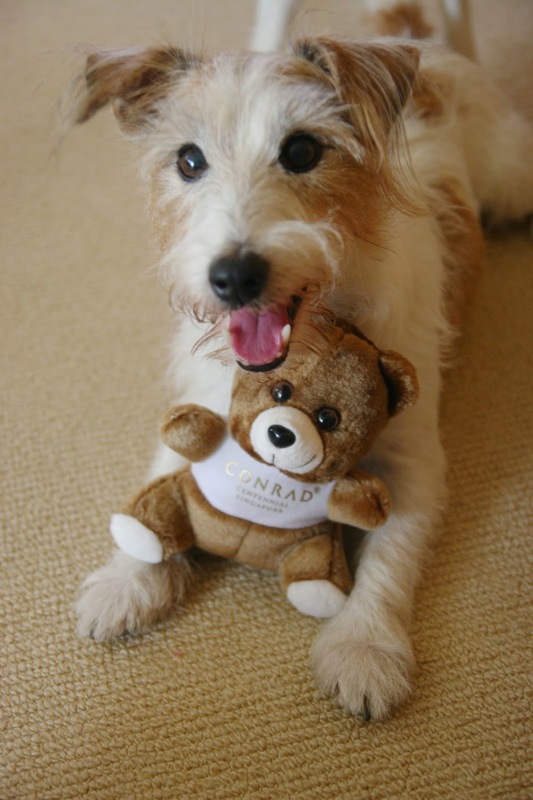 Pecan ah ma wasn't too fond of it but lucky for her, she found her own toy in the form of the Conrad bear! Although the perks didn't include a dog bed, it really didn't matter to us. After all, those who know us, will know that the Loo Lim dogs only sleep at one place - the actual bed. The bed may be a little too high for us to hop on to it, but that was hardly an issue. Once we got on it, we refused to get off. And again, worse come to worse, there's always the tub. Hehe, just kidding. Our parents wouldn't dare to confine us to the loo lor. Besides, there were so many sofas in the suite for us to couch surf. There clearly was no lack of space to sleep. Staycations are nothing new to me. Can't say the same for Pecan ah ma though. She was clearly confused for the better half of the first day and appeared a little unsure of why she was here. As a result, she ended up following me around a fair bit. By the evening, she was pretty comfortable and started exploring the space on her own. The one thing that we both love about the suite had to be the carpeted floor! I had a ball rolling on it, while ah ma loved sitting on it. Our parents actually found us in this position a fair bit during the whole stay. As much as our parents would love to just stay in the room 24-7, they understood that we still need our toilet breaks and daily exercise. Thankfully, there were plenty of grassy areas surrounding the hotel for us to peepee at. In addition, we also spent the next two days exploring the vicinity. We covered Gardens By the Bay on Day 1 and a nice long walk from Conrad to Esplanade to Marina Bay Sands and back on the second day. I guess it worked out extremely well as we were really zonked out by the time we got back each night. Sadly, good things always have to come to an end. We really didn't want to go home and sulked in protest as our parents started packing. We all know that Daddy doesn't print money for a living (WHY NOT?!). So, we had to check out after just two nights. All in all, the staff and most of the guests at Conrad were really friendly towards us! We got so much attention from them! Tons of pats and praises! Despite that, there were a couple of other guests that appeared shocked (not in a good way) to see us. So, our parents did what they could to minimise the time that we were in the lobby to avoid upsetting others. This was certainly a great way to end our year! And guess what, our parents are already discussing when to do our next staycation! Hehehee... and we are keeping our paws crossed that it will be soon! 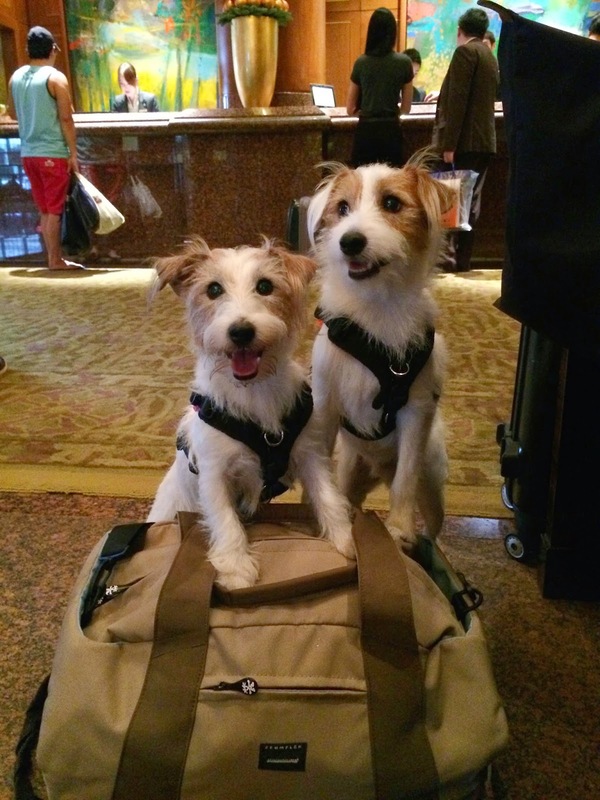 Hi there, do you guys have to be in carriers upon check-in and other hotel lobby areas? Hello! May I know if the $150 cleaning fee is separate from the non-refundable $150 deposit as stated on their website? Or is it the same thing? Thanks!